Bed bug control is a serious issue, often requiring multiple treatments and methods of approach over the course of the pest management program. Bed bug treatment and control should not be taken with a "do it yourself" approach. While it is possible to treat and control bed bugs without the assistance of a professional, it is not recommended. Control of these pests will require education and diligent effort over an extended period of time to ensure their eradication. In all cases, professional advice and an integrated pest management approach should be taken. Integrated Pest Management (IPM) is an effective and environmentally sensitive approach to pest management that relies on a combination of common-sense practices. IPM programs use current, comprehensive information on the life cycles of pests and their interaction with people and the environment. This information, in combination with available pest control methods, is used to manage pest damage by the most economical means and with the least possible hazard to people, property, and the environment. Bed bug treatment and control should not be taken with a "Do it yourself" approach. 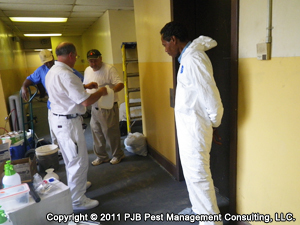 Bed bug control is most effective when an IPM approach is implemented with diligent participation by the residents. In multi-family housing, diligent participation is also required of the building management. IPM takes advantage of all appropriate pest management options, including the judicious use of pesticides. Although bed bugs may sometimes be controlled by non-chemical means alone, this approach is often very difficult, potentially less effective, and usually more resource intensive. A coordinated community IPM program can alleviate both the discomfort and cost of managing bed bugs. The underlying philosophy of a bed bug IPM is based on the fact that bed bug infestations will not go away without intervention. Intervention is most effective when populations are low. Such a coordinated effort could create a partnership among government, property managers, citizens, and pest management professionals to ensure an effective intervention facilitated by environmental health professionals. EPA and CDC recommend that pest management and environmental health professionals throughout the U.S. continue to use IPM strategies as they address the bed bug issue.